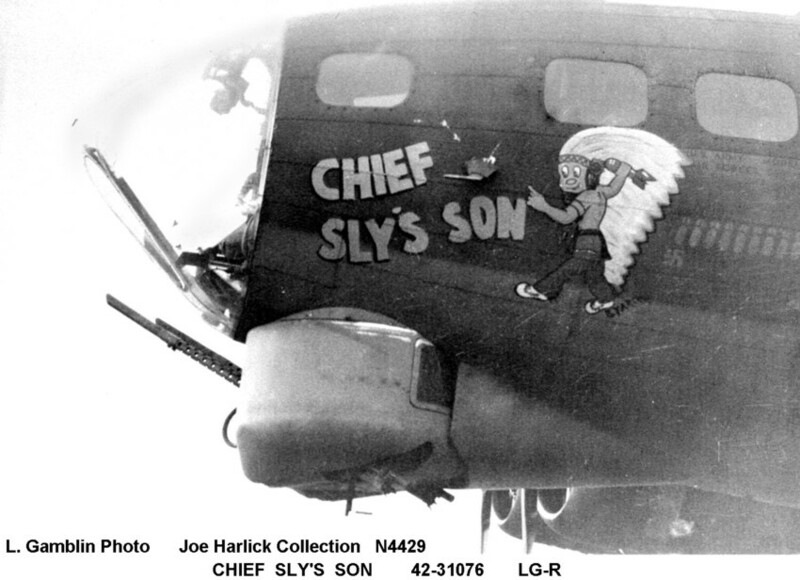 Delivered Cheyenne 16/9/43; Gr Island 3/10/43; Assigned 323BS/91BG [0R-L] Bassingbourn 16/10/43; transferred 322BS [LG-X]; Missing in Action 18m Oschersleben 11/1/44 with J. C. Page, Navigator: Larry Lynch, Bombardier: Bill Stevenson, Radio Operator: Albt Macos, Ball turret gunner: Arlie Wotring, Waist gunner: Jim Alfred, Waist gunner: Chas Brokke,Tail gunner: Warren Oliver (8 Prisoner of War), Co-pilot: Tom Butler, Flight engineer/top turret gunner: Art Ginder (2 Killed in Action); enemy aircraft set wing on fire then ship exploded, crashed Schmede, near Dummer Lake, seven miles SW of Diepholz, Ger. Missing Air Crew Report 1919. CHIEF SLY’S SON.